A functional inspection is called for when it is desired to simply know the current status of a gearbox. It is advisable when purchasing a used racecar or transmission, or if it is simply desired to ascertain the condition of your gearbox. 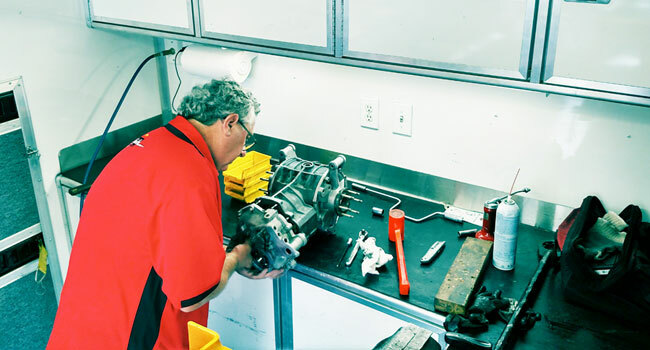 The inspection consists of disassembly of the transmission into its major components, cleaning, inspection, and reassembly. A written report on the condition of the gearbox is then issued. Rebuilding of the bearing carrier consists of complete disassembly of the bearing carrier unit, cleaning, inspection, and written estimate. Upon approval of the estimate, the bearing carrier components are prepared to Taylor Race Engineering standards, set up and assembled for precise shifting and minimum drag. Price is for labor only. Parts not included. The bearing carrier is removed, but not disassembled, and the pinion shaft, clutch mechanism, and usable studs are removed from the old case. The side cover assemblies are removed and disassembled, as the preload and backlash must be reset. The differential is not disassembled. A new reverse idler spigot is installed, and the reverse gear backlash set. The pinion is set up to factory specification in the new case. New stub axle seals are installed, and the differential bearing preload and ring and pinion backlash are set to factory specification. The shift forks are then reset to match the new case, and final assembly is done. Price is for labor only. Parts and machine work not included. A Taylor Race Engineering, Inc. blueprint includes the following: The transmission is disassembled completely, and all parts are cleaned and inspected by a combination of visual, Magniflux®, and Zyglo® as necessary to determine the extent of wear. An estimate, detailing the parts and labor required, is provided to the customer for approval prior to commencing work. Any required casting repairs are accomplished. All components are prepped, set up, and assembled using Factory tooling and fixtures. The pinion setting is verified by running a pattern to determine the exact ideal position. If necessary, the ring and pinion are lapped in place for perfect mating. The preload on all tapered roller and ball bearings is customized to the horsepower of the engine and type of use (we have determined the minimum possible friction for each situation). The shift rails are trued, the detents radiused and the rails polished to a high luster for shifting smoothness. The shift rail bores are trued and polished. Shift detent springs and balls are matched for perfect shifting feel. The shift forks are aligned and shimmed precisely so that no friction exists when the gears are engaged. Our "Snap Shift©" modification is performed to speed the diagonal upshifts, enabling brutal, but fast power shifting. For sequential gearboxes, the shift drum is deburred, polished and trued, and all other componentry is matched and polished for perfect sequential shifting. The drum is set up so that no fork to dog drag exists after gear engagement. Note: For transaxle gearboxes, setup of the shift forks to match the new ring and pinion is included in the price. Labor only. Parts and machine work not included.